Princeton's 4K-capable video production studio is now a shared resource that serves a variety of campus needs. Reorganizations can be tough on everybody involved. Work left behind. People's emotions rubbed raw. New managers struggling to gain staff trust. But a restructuring within Princeton University (NJ) turned out to be a great example of how collaboration in higher education ought to work. And it all kicked off when the university decided to create its first massive open online courses (MOOCs). Back before many people had really heard of MOOCs, the Broadcast Center in Princeton's Office of Information Technology (OIT) was already busy. On any given day, according to David Hopkins, senior manager of the team, the center might be delivering live television or radio interviews with Nobel Laureates or other faculty members for coverage on Good Morning America, the Today Show or some other global media outlet, making promotional videos, streaming and recording real-time interviews or campus events, and producing "job talks" — recorded lecture samples for people applying for faculty positions. The advent of MOOCs threw a monkey wrench into those smooth operations. Suddenly, Princeton had to figure out who was going to produce those videos for the Coursera platform. 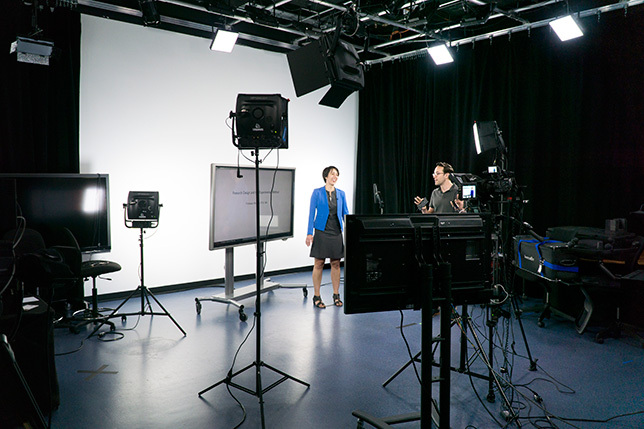 The Broadcast Center was brought into the university's McGraw Center for Teaching and Learning and charged with creating a couple of pilot MOOCs. Those turned out to be a success, with some programs garnering registration in the tens of thousands — and demand grew for the creation of additional MOOCs. Eventually, Princeton took its MOOC programming to additional platforms, including edX, NovoEd and Kadenze, a couple of which were so new, the Broadcast Center staff needed to handle bug fixes and other support issues. "The challenge was that we didn't have a large group of full-time employees to support the MOOCs and then also support our normal activities," said Hopkins. The answer: make MOOCs the Broadcast Center's priority and outsource the rest. After all, that was what the center already did whenever there was too much work for its tiny crew to handle — hire local production companies and videographers to pick up the slack. But that approach only worked as long as cost wasn't a concern and the university could tolerate the uneven production quality of working with non-campus companies. Once the Office of the Dean of the College realized just how much was being invested (and what was being lost) by not using internal services to create videos, the need for change was clear. 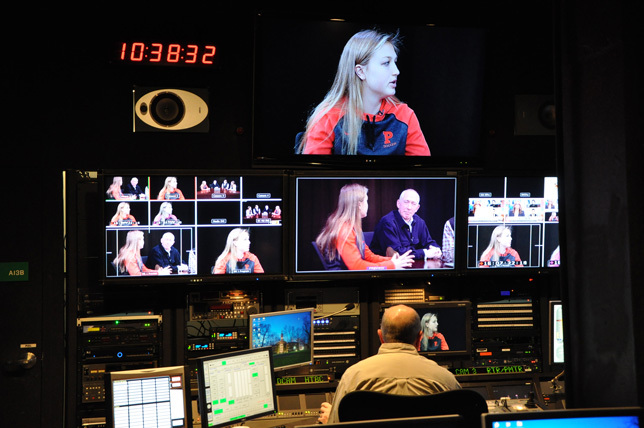 Some two years after MOOCs became the main job of the Broadcast Center, the university renewed its focus on services for Princeton students. As the thinking went, while it's wonderful for thousands of people from outside the university to experience what it's like to learn from a Princeton professor, "the students should be the main priority for online course development," noted Hopkins. Concurrently, hybrid and flipped courses were surfacing at the institution. Taken together, those two changes in priority made it a "good time for us to really concentrate on internal production that we needed to have happen, benefiting the students first," he said. In order to provide more focused services for the internal needs of faculty and campus partners, OIT created a newly organized Instructional Support Services (ISS) division in 2015, eventually led by Associate Director Richard Bakken. That organization was charged with all kinds of responsibilities, including overall faculty technical support in learning spaces, along with AV event support, cluster computing and printing. At the same time, the Broadcast Center was moved out from under the McGraw Center and turned into a Video Production Support group within Bakken's new division. However, MOOCs stayed within the realm of McGraw as the Online Learning Environments group, which meant McGraw needed help creating videos too. Left without its own facility, McGraw began planning for its own studio to handle that MOOC work as well as teaching and learning recording projects. But, as Hopkins pointed out, "Here we already had a multi-million-dollar studio in place. And it didn't make sense to outfit a building to [duplicate] the requirements for audio and control and all those efforts that go into making a quality studio." ISS suggested sharing the studio already in place. Using feedback from both teams, it was determined that there were certain pieces of equipment that the studio lacked. "We asked for [McGraw's] requirements," recalled Hopkins. "They went down their list of what was needed, and we said, 'Well, we would like those things too.'" At the top of both organizations' wish lists was an interest in upgrading the technical capacity of the production studio to 4K. 4K provides better clarity of image than previous recording technology, which becomes increasingly important as new devices have the capability of displaying higher-quality images. Nobody wants to spend $999 for a phone to have it display 320x240 video, noted Hopkins, when it can accommodate a much higher resolution — akin to jumping from old-fashioned videotape to Blu-Ray. Just as important, 4K also makes the production team more efficient. When shooting a full-screen 4K image, such as an interview between two people, Hopkins explained, zooms won't lose resolution. Previously, doing the same kind of shot would have required two production people: one to focus on showing the speakers and the other to prep a zoom shot. Now the same shot can be handled by a lone crewmember. The camera is on a track system, allowing the person behind the scenes to control movement back and forth, up and down. "You would think it was a three-camera shoot, and you shot everything with one camera," he said. The 4K upgrade cost about $150,000, estimated Bakken. That included an ATEM 2 M/E Production Studio 4K switcher and related gear from Blackmagic Design; a Sony PXW FS7 II 4K XDCAM Super 35 Camcorder for 4K recording and streaming; a 75-inch 4K ViewSonic touchscreen for faculty to work with their presentations; along with multiple 4K and other monitors from Blackmagic, Panasonic and LG. The upgrade occurred about a year ago, about the same time Bakken joined OIT to lead ISS. Since that time, McGraw put a new director, Rebecca Graves-Bayazitoglu, in place. And the two units have had to figure out the best way to prioritize and schedule work. Ultimately, said Hopkins, the studio space is "at the mercy of news." When a professor is being interviewed on television, that takes precedence over anything else the studio works on. After that, it's sorting through faculty needs and wants. "We work back and forth. We stay in communication with each other for different ideas and plans that are coming in place so we can be prepared for it," Hopkins noted, adding that scheduling is made more complex because some setups take longer than others. "We want to make sure we have the equipment ready to go for those productions." A recent project, for example, involved figuring out how to help a faculty member use Google Hangouts. Setup for that takes more than simply turning on a computer webcam: In this case, there were five or six students in the room with the professor, and another nine to 12 being remotely connected through Google's videoconferencing service. The tricky part is getting good quality audio, so in-studio guests' microphones are individually recorded onto separate files for later editing. On the remote side, the audio is recorded as a separate track for editing. "A lot of hours of effort and testing goes into that process," Hopkins pointed out. When the studio is used for a Google Hangout, audio for each in-studio participant is recorded separately for later editing. To improve customer service and the ability to engage with clients across the university, OIT also recently implemented ServiceNow, better known for its help desk management functionality. When a new project requires studio time, somebody from ISS or McGraw fills out a service ticket to request that it be added to a master calendar being used by the video production group. When that's done, the requesting person gets a confirmation. Really, however, the smooth running of the studio comes down to communication, which "is always the challenge," asserted Graves-Bayazitoglu. "Because of our collegiality and the way we collaborate, we often get faculty wherever they need to go without too many steps." When it comes to cost, ISS and McGraw follow separate routes. On the McGraw side, a faculty member or graduate student will present a project that needs studio time, which Graves-Bayazitoglu's organization will consider in terms of its fit with institutional priorities and planning for online learning. "Usually, we'll say, 'Yes,' or talk with the faculty member about how to bring it in line with our mission," she said. There's no chargeback for that studio work. To cover additional costs in terms of outside support, such as extra editing or filming, McGraw will find out whether the instructor has funds to defray that cost. If not, the center will seek university funding set aside to support the online work. On the OIT side, the focus for resources is to support teaching and learning activities, along with other events and initiatives to support the mission of the university. That covers special events and activities, such as streaming commencement and opening exercises. When it crosses into teaching and learning, such as the upgrade to 4K, the same resources cover that work too. The entire effort, said Bakken, is an opportunity to engage with campus partners who share a similar mission to assist faculty and students with support for their courses and assignment work. The upgrade wasn't a slam-dunk, insisted Bakken. "We certainly had to make a proposal and share how we would use those resources to really make a difference. I think we've been successful in that effort." Hopkins is simply content that the two sides met in the middle to push the upgrade forward. "It's helped us on our side to increase the quality of the work that we do and to further benefit the university." Next up for McGraw and OIT is renovation of McGraw's digital learning lab, which will soon move into the construction phase. "It's really a re-imagining of the space to be a cutting-edge place that faculty who teach in multimedia can use for their class sessions, [and] where students can come and work on their advanced video/podcast/soundscape projects," said Graves-Bayazitoglu. The "core" will be well-equipped, flexible classroom spaces with staff on hand, ready to train and support. The instructional support team is helping with the technical and support requirements for this new space, added Bakken, and OIT's hardware support group will handle the networking piece. "It's another opportunity for us to collaborate," he said. In effect, both groups are thinking about how the technology can support the learning. Their success in collaboration is due, observed Graves-Bayazitoglu, to "all of us thinking together as we design spaces, implement new technology in the spaces, arrange the spaces, and then help the faculty learn how to make the most of those spaces."